Stępina pronounced [stɛmˈpʲina] is a village in the administrative district of Gmina Frysztak, within Strzyżów County, Subcarpathian Voivodeship, in south-eastern Poland. 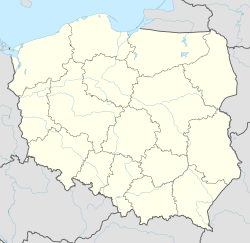 It lies approximately 7 kilometres (4 mi) north-west of Frysztak, 16 km (10 mi) west of Strzyżów, and 36 km (22 mi) south-west of the regional capital Rzeszów. The village has an approximate population of 920. Stępina is the location of one of Hitler's bunkers called Anlage Süd, built in 1940-1941 with slave-labor from the Szebnie concentration camp nearby. Over the course of the camp's operation some 10,000 people perished, including Soviet prisoners of war, Polish Jews, non-Jewish Poles, as well as Ukrainians and Romani people. The remains of the camp in Szebnie were entered by the Soviets on 8 September 1944 during counter-offensive of the Red Army. ^ Ronald Berger (12 July 2010). "Surviving the Concentration Camps" (Google Book). Surviving the Holocaust: A Life Course Perspective. Taylor & Francis. pp. 91–92. ISBN 0203848519. Retrieved 4 July 2013.